There once was a wonderfully weathered old cross, constructed of aged rose wood and shiny silver that hung for decades on a rusty steel nail, attached to a living room adobe wall in a little town, known as Jamul. That sacred wooden cross-for many decades symbolized to the Vesco family and to the rest of the world that peace, compassion, and forgiveness is what life should be all about. It also helped them to realize, someday they would be forever reunited in the kingdom of heaven. Those memorable years of family time spent together, eventually melded into the sweet splendor of seasons spent, and still that cross-hung silently on the wall. There are so many wonderful things that you can observe in life which can actually take your breath away in the Jamul backcountry. Especially, the beautiful rolling hills and valleys surrounding the Colina Verde nature preserve, with its skyline mountain ridges that are carpeted with blooming sagebrush and chaparral, massive boulders, and daily Van Gogh inspired colorful sunrises and sunsets. There are horse ranches and stately old oak trees nearby, a plethora of bird varieties, beautifully hand constructed stone retaining walls, an abundance of open space and wildlife, and of course, my favorite, is the neon green colored vineyard flora. There always seems to be a cool and steady wind that blows off the Pacific Ocean into the Jamul mountains. At 1300 plus feet above sea level, the wind is impressive, fresh, clean, and pure. The Colina Verde area is absolutely amazing in it self, translating appropriately in Spanish to “green hills”. Perhaps this invigorating wind that finds its way into Jamul each day is what keeps this rural sanctuary a pristine hideaway of peace and quiet. There is no light pollution invading here at night from the city into these magical hills either, making it a perfect place to discover where the mountains actually mingle with the stars. Long before the sprawl of the city of San Diego began in the late 60’s, this wonderful mountainous property was personally selected as the perfect home site location, situated next to a massive 6000-acre nature preserve. In the early seventies, the Vesco family had a windy dirt road and a minimum of the brush covering the land cleared back to a leveled hilltop crest. Shortly thereafter, work began on this unique 3500 square foot C shaped Adobe ranch style home and the smaller adjacent adobe home. 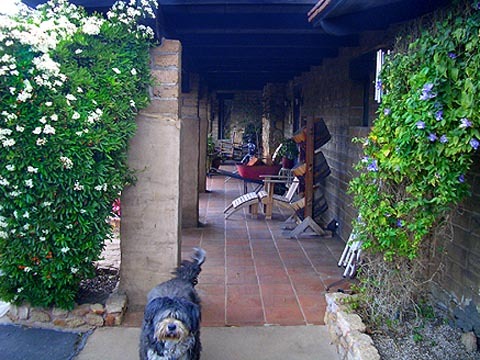 The Colina Verde properties were painstakingly built from custom molded hot-fired adobe mud bricks. Over 17,000 of these compressed adobe bricks were prepared for the larger home, made from locally dug up earth; they were assembled one brick at a time to create unique Mission style homes. Centuries ago, long before this family was born, the Spanish Missionary Padres came to America via from Spain thru Mexico in 1769 with numerous new ideas and invaluable building information attempting to spread Christianity abroad. The Vesco family researched similar adobe construction techniques for their new home and they also planted a small vineyard, similar to the ones planted centuries ago, for they knew it was an age-old tradition known around the world that even Jesus spoke of in the Bible. Several years passed and the unique adobe construction was finally completed. 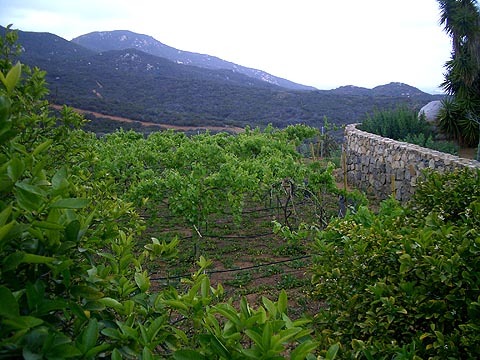 The perimeter retaining walls were constructed of magnificent stone rocks gathered locally from the Daly Ranch rock quarry, enclosing the acres of newly planted Petite Syrah European grape vines. For decades now, the vines have quietly grown in designated rows on welded cross type supports with wire leads, refreshed by the pure well water from deep under ground. The vines are now quite large, producing massive amounts of wine grapes each year that bask under the California golden sun. This property is as authentic as it gets for a historical Mission style home, with sixteen-inch thick fortressing walls, imported Mexican saltillo clay flooring, rugged wooden beams, custom stone rock fireplaces, and awe-inspiring views. Amazingly enough, this unique home and property also boasts a separate wine production facility, with an under ground temperature controlled wine cave aging room, dozens of oak wine barrels filled with port, and wine making equipment. 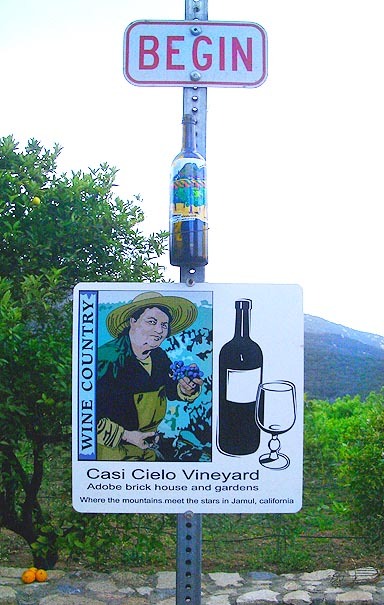 Colina Verde is still an actual private working micro-winery. Before the invention of television, modern day cellular phones, wireless lap top computers, and split second internet access, families actually used to spend a lot more time doing productive things together. They found that their quality time spent was a good thing to have in common, while discussing the importance of family issues. They acknowledged their love for each other, and they silently said their daily prayers of thankfulness. It seems kind of awkward to try that now days, unless you have done it your whole life. Being of the Christian faith it has always been easy for me to give thanks at prayer. Unfortunately, there are still too many unbalanced individuals and groups out there these days spouting their negative attitudinal ideologies of what is wrong in their world, not what is right. Here is an idea for you off centered individuals. Get a life, and trying living it productively with others, and stop complaining about it, because the rest of the world does not want to hear about your repetitive complaints. The past was a simpler time to live in back then my friends, or maybe families just made it more of a priority in their lives to lend a helping hand to one another, rather than become a heavy burden. Maybe it is important for all of us to go backwards in time, to learn what might lie ahead for us in the future, if we really want things to change. To nurture something of importance in your life and be humbled with your responsibilities is a true sign of love. Even though the Colina Verde vineyard property has been vacant now for several years, it still has a magnetic energy about it, making it a simply amazing place to live. Unfortunately, for all of us, time is like running water, it eventually evaporates before our own eyes leaving us wondering. Where did the rest of the water go, and all of the minutes that we had left in our lives? It is with great honor, respect, and admiration for this pioneering family that I have chosen to write this personal short story, as my wife PJ and I will soon be the new caretakers of this wonderful property. It is a huge responsibility that we take on, so to the owners of Colina Verde, the Vesco family, I give you my solemn promise to hold up your belief that God will always be our guiding light as well, as he was for your family over the passing years. Now that you have wonderfully made it into your 90’s Marie, I want you to know that my family and yours have now been co-mingled to accomplish a good thing together. To carry forth a torch of family tradition and Christian beliefs that will not be extinguished as the world keeps changing all around us. Please, do not worry so much now about your beloved Colina Verde, for we will love and care for it the same way that you cared for your family over the passing years. I would also like to let you know that I spoke with your grand daughter in March of this year at the property, as she was attempting to trim back the acres of Petite Syrah Vines while holding back her emotions from recent family loss. I showed her where to trim the tops of the vines with a guided hand and communicated to her that we all have destinies that are bestowed upon us from a higher power. She was very sad for the fact that she was lonely and felt that she would never be able to return to this wonderful place, once it was sold. A warm and tender smile came over her worried face when I told her, that if we were chosen as caretakers of the family property, she and the family would always be welcome to visit us in the future. Be reassured that the vineyards and gardens will flourish once again in bountiful amounts, because I have learned from our heart-warming conversation months ago, that when God has plans for people to meet, there is always a reason, and good things usually come from it. The next day I drove by and picked up some of the bare vine cuttings left on the ground and I said a little prayer as I brought them home with me. I carefully watered and planted all of them into potting soil after dipping them in root hormone powder, and then let them rest for several months to take root. Now, as I sit in my GregoArt painting and writing studio finishing this short story in October of 2006 some seven months later; please smile and laugh a little bit with me today when I tell you that I have over 50 original scion root stock cutting petite syrah vines ready to go back into the ground at the Colina Verde vineyard. An abundance, to replace the ones lost to those adorable hungry rabbits that hop around all over the property. One by one, I will resurrect the vineyard back to it original grace and splendor, and I hope it makes you proud of the fact that the tradition of viticulture will continue on, for generations to come. Sometimes in our lives, we accidentally find out that our life’s calling has always been there right in front of us, each and every day. All you have to do is be awake enough to follow your dreams and listen to your heart to find it. Awake enough to realize your potential and ambitions to do something good for others, as well as for your self. I noticed yesterday on our final walk thru inspection Marie that you secretly instructed someone to leave that antique rose wood and silver cross on the top shelf of the master bedroom closet for us, the one that once hung for decades on your family’s living room adobe wall. I also discovered Paul has secretly signed wine bottles, hidden just behind a wall in the underground wine cantina. These are “good things” that you did for yourselves and for others. So as our destinies continue to intertwine, and the ticking hands of time never seem to slow down any more, I just wanted to tell you that I am so humbled by your cleverness and kindness. I have searched my whole life to find a custom stone built home like yours. It is a wonderful place that has a real calming and spiritual magnetism for us. My father “Carl Leroy Maness” was also a master stonemason in his days, building monuments of beauty across America. Even as a young boy, I clearly remember that my father was always fascinated by building homes with earth colored rocks and stones, he had a passionate love for growing plants as well, which eventually influenced his entire life and career. As I grew older, I had always wanted him to build a stone rock residency for our family, but that never happened. Thank God, he did genetically pass on to me his only son, those fascinations, appreciations, and a pair of green thumbs, allowing me to amazingly grow things, just as he used to do. To the talented Vesco family, I wish you all to raise your wine glasses one more time today in celebration not sadness. To my recently departed father and mother, I proudly tell you that I have finally made it home, to a place that seems to be calling my name in the wind that blows. Very soon, that special antique rose wood and silver cross will be removed from that darkened closet and righteously secured back onto the adobe wall where it once shined so brightly for decades in the past. It is in the power of the cross, where we will find remembrance of each other, and ever-lasting life. With destiny, sacrifice, conviction, and inspiration engrained into my thoughts and heart, I am thankful for this opportunity to make a difference by giving “something good” back to a family that once worked so hard to create such an amazing place to live. There is a wonderful phrase spoken in Spanish that perfectly describes this unique home transition, and it is one about sharing and friendship. It is mi casa, es su casa, which literally means, my home is your home. In closing, there are vines to be replaced, a well to be fixed, seasonal grapes to be grown, and wine to be made in the upcoming years. I realize thru introspection today, that one of the greatest gifts you can ever offer to someone is by cherishing their memory and sharing what they have accomplished in their lives with others. Sometimes changing things though is not a good idea, for it removes the sanctity of the way things once were. We are looking forward to simplifying our lives as well, living closer to the earth and the grapes, with a minimum of complication, and sharing of wonderful stories. I leave you with a bit of well-deserved news today. Next year at fall harvest in 2007, our first tribute wine bottling will be started on site. It will be made of estate grown Petite Syrah grapes from the vineyard, and it will be called “Vesco’s Trinity Red”. I hope this helps you all to realize that your family’s dreams will remain alive and well with us, right next to that beautiful cross to be re-hung on the living room adobe wall. There is a grip of work to be started upon this year after the Christmas season ends celebrating the birth of Christ. With the minutes of our lives ticking away, we are thankful for our new blessings that have been bestowed upon us. In quiet thought today, I realize that I have learned a wonderful life lesson that was taught to me at an early age by my parents. It is that hard work and dedication builds your foundation and character, determining how you envision the world and accomplish things. Once in a while, I can still hear their voices whispering to me in the wind that blows thru these quiet hillsides, encouraging me to keep moving forward. I realize that it is a daunting task that we now take on, one that will require years of patience and sacrifice to complete to our rigid satisfaction. When all is said and done, our efforts will not be in vain. They will simply be efforts directed at keeping this little part of the world a beautiful and wonderful place to live at, far away from the hustle and bustle of the big city life. Each day my heart skips a beat when I think about Colina Verde. 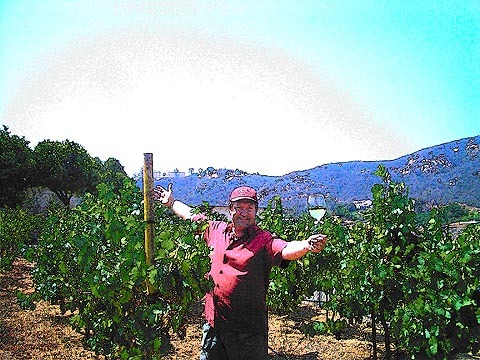 It is my hope that every one of you who reads this short story will eventually make your way out to Jamul for a visit to see this wonderful estate. 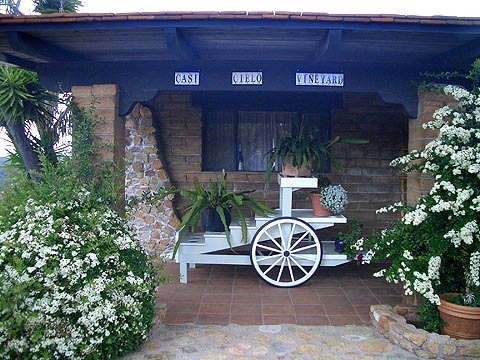 The residents of Jamul are already well aware and appreciative of the Vesco family’s original pioneering spirit and efforts decades ago to bring culture and grace to this small safe haven in the hills. We invite you to come and breathe in some fresh air and enjoy a glass of wine as you wander around thru the vineyard sections, discovering its spell binding amazing grace. Centuries ago, vineyards were planted along the El Camino Real in California and also at many of the original 21 Catholic Missions with a guiding persistence from the Spanish Padres, as homage to the miracles and wonders that comes from wine. The earth is fertile and orange colored here in this little town known as Jamul, still home to just one traffic light for all of us to share. The church bells at Saint Pius down the street still ring on Sundays, reminding me that our time to shine has finally come. It is time for us to start planting our new ideas, nurturing them, and watching them grow. With God’s guidance at our side, we are now empowered to follow our hearts, ambitions, and our dreams. Lord, I ask one thing of you today. I pray that you will give us the strength and vision to keep moving forward with this blessing that you have bestowed upon us. Onward we march to the resurrection of the Colina Verde Vineyard. In Jesus name we pray, Amen.